Ideal for use in care homes, hospitals and nursing homes. 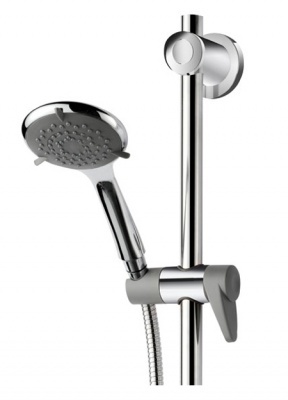 TMV3 approved thermostatic exposed concentric mixer shower. Easy to grip and control, low resistance separate lever controls for flow and temperature, front facing for easy access. 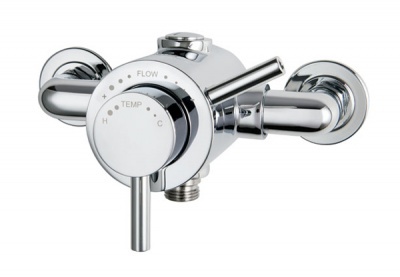 Greater control by the clear flow and temperature markings. The hygienic design avoids the formation of dirt traps. Automatic shutdown safety feature should either the hot or cold water supplies fail. Separate tamper proof flow and temperature controls for ease of use. Includes dual purpose grab riser rail able to withstand up to 150kg support load & rub clean five spray pattern shower head.